Jessica Moorhouse is a millennial money expert. She is an award-winning personal finance blogger and podcast host who teaches millennials and freelancers alike how to manage their finances. On this episode, she breaks down the common misconceptions about finance and talks about what it really means to manage your freelance income. Every freelancer needs a personal finance strategy in order to protect their income and their future investments, including retirement. But where do you start your financial planning when you’re just starting your freelance career? 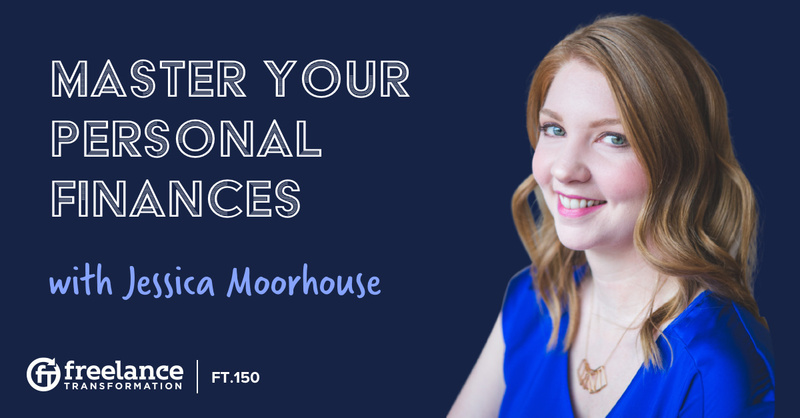 Jessica Moorhouse discusses a three-step framework that will help you get your finances in order. Figuring out your net worth is the first step in Jessica’s strategy. That means figuring out how much money you have and how much money you owe. What’s left over is your net worth. For freelancers, this amount can change every year. It can even change every month. But that doesn’t mean you have to stress about your income. As long as you have a general idea of where you are now and where you want to be in the future, you can figure out your net worth and start managing your finances. It’s really about how you can optimize your financial situation to get where you want in life. Don’t assume you have to have it all figured out up front, either. Jessica says it is completely normal to take another look at where you are after the first 6 months of self-employment. At that time, you’ll have a little more experience and a better idea of your earning potential. Then you can see if you’re making more or less than what you thought you would, and you’ll be able to make an average assessment of what your annual income will be. The second step in Jessica’s framework is everyone’s least favorite, but she has a trick to make budgeting easy and more rewarding. Creating a budget doesn’t mean denying yourself the simple pleasures of life, or even only eating noodles for an entire month. Instead, look at your budget as a way to save for the big thing you want most. Travel, shopping, a new car – build your budget around saving for that big thing and then consider your other expenses. Your budget is your plan of how you want to spend your money. We all make money, we all save money, we all handle money. This is absolutely something anyone can learn on your own. You do not have to get a degree in finance. Budgeting becomes a habit you create rather than a strict rule you have to follow. Where you want to save your money and where you want to spend your money is entirely up to you. But if you pay yourself first, you’ll be more likely to stick to your budgeting plan. You’ll be more likely to create a savings when you know exactly what it is you’re saving for, and you’ll be less likely to go off budget if it means sacrificing your big goal to do it. Take a good look at your budget, your spending, and your net worth to get an idea of where you’re at and how you can improve the next month so you can reach those goals you have set in your budget. Track your spending in order to stick to your budget, too. Once you’ve paid yourself and your big savings goal, take a look at your fixed expenses (like your mortgage, insurance, and utilities) and your variable expenses. You know you can’t miss the fixed expenses, so figure out which variables you’re willing to sacrifice in order to continue meeting your savings goal. Now, this goal can change once you start earning more money, and these variables can also evolve as your freelance career moves forward. Don’t ever think that your budget is set in stone. Remember, you are the one that created it so you can change it up at any time. Finally, Jessica offers advice on how to save for your retirement. Your retirement plans are unique to you and your needs, and there are a lot of calculators that will help you work out how much you will need to save in order to make retirement possible. But how you want to budget and invest that money is entirely up to you. Jessica breaks down the big three investment fund options available to the self-employed in order to give you a better understanding of your investment options. There are a lot of popular investment strategies freelancers can choose from, and Jessica’s advice will help you pick the strategy that works best for you. The reason why diversification is so important is because, if there is an economic collapse…you’re invested in a lot of different ones so it will balance itself out and you won’t lose all of your money. Her biggest piece of advice in today’s episode is to diversify. You can protect your income and your investments when you invest your money into diverse opportunities. Working and saving are not the only ways to grow your money. Knowing a few tricks of the trade will help you better manage your personal finances and your retirement plans.